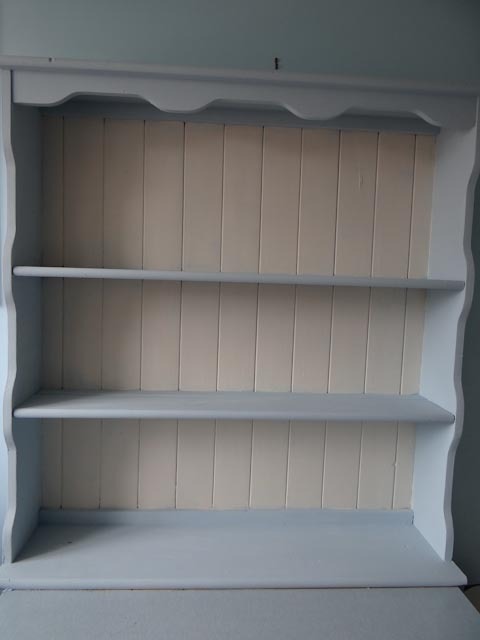 I bought this dresser top for £15, it was the usual yellow pine – so I painted it a light blue and cream. 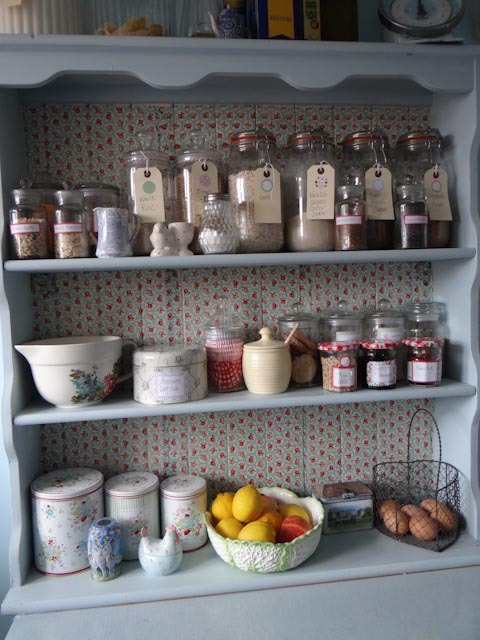 There has been a lot of popularity for expensive paints that give a more chalky effect but the cost of them is huge! as much as £50 per 2 1/2 litre! 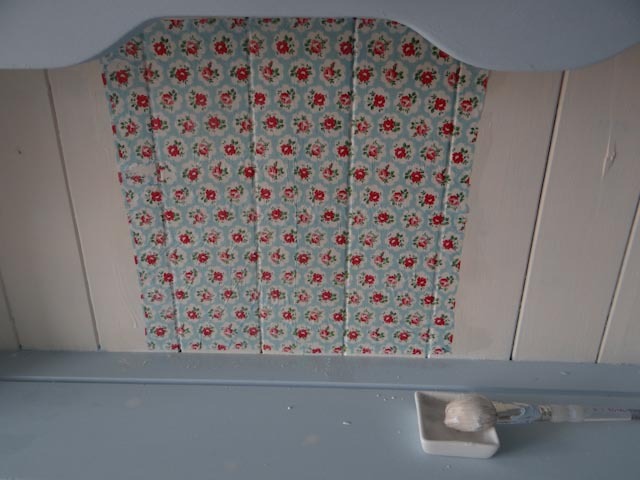 In order to thicken the paint and create a more chalky texture I added three tablespoons of fine plaster to an ordinary standard tin of paint. I kept on mixing until the consistency was like whipped cream. It meant the coverage was very effective without too much preparation. 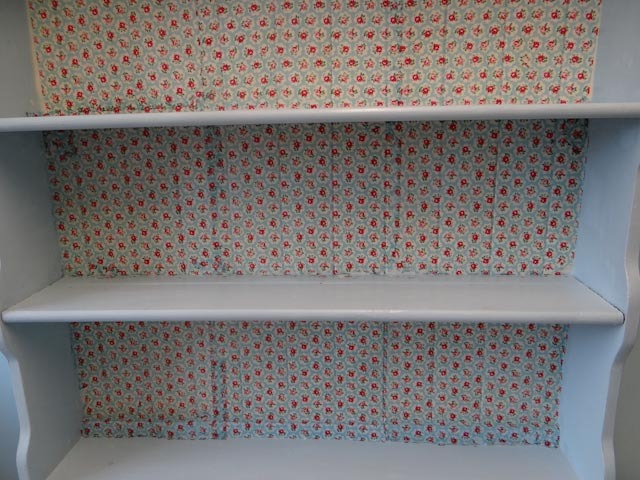 I painted the back of the dresser in a white cream as I intended to use napkins to create a colourful background – the white would create a better base for the pattern. I gave the dresser a thin coat of varnish and allowed it to dry for a day or two. Patio paint is a wonderful medium, it is waterproof and can be used outside. 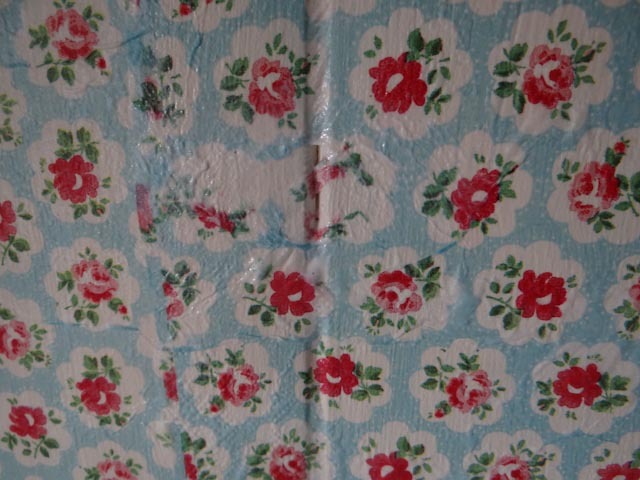 It transforms napkins into a easy decoupage as it is gentle enough not to tear the delicate print. I buy the clear paint, but you can also get them in a range of colours. 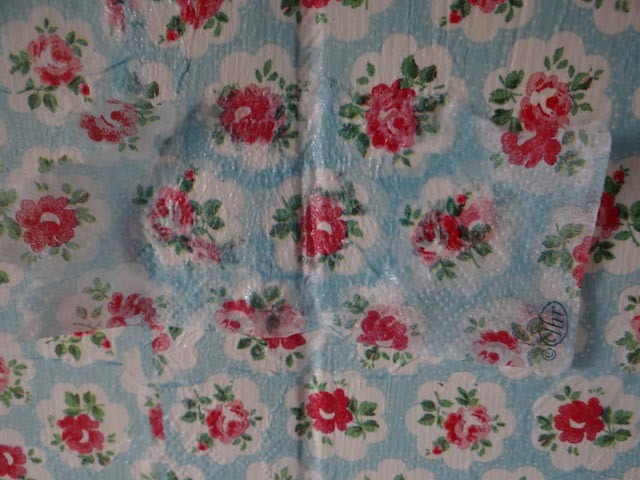 You simply separate the sheets of the napkin until you have one fine patterned layer. With a very soft brush you simply paint the patio paint onto the surface and then gently lay the napkin over – painting another layer of glue and gently smoothing it onto the surface. 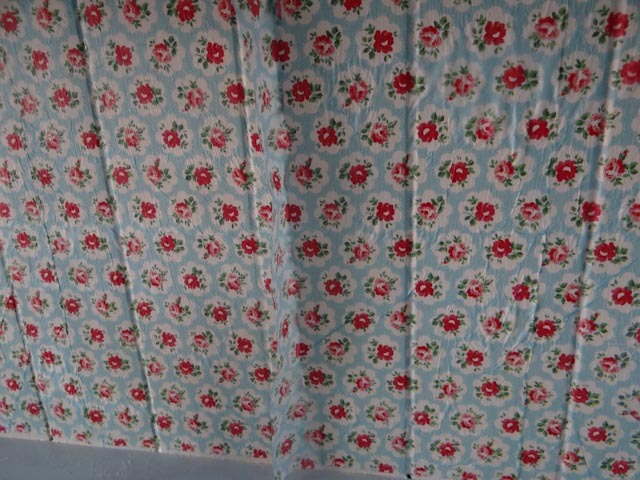 If the napkin does break, you can repair the gap by laying a matching piece over. 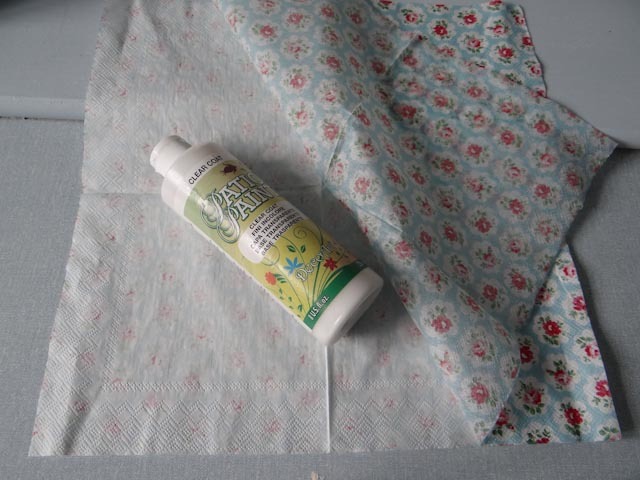 Keep pasting the napkins onto the surface until you have covered the area – allow to dry and then repeat another layer of patio paint over to seal. This can be used on any number of items, I have used it for tins as well as pots. 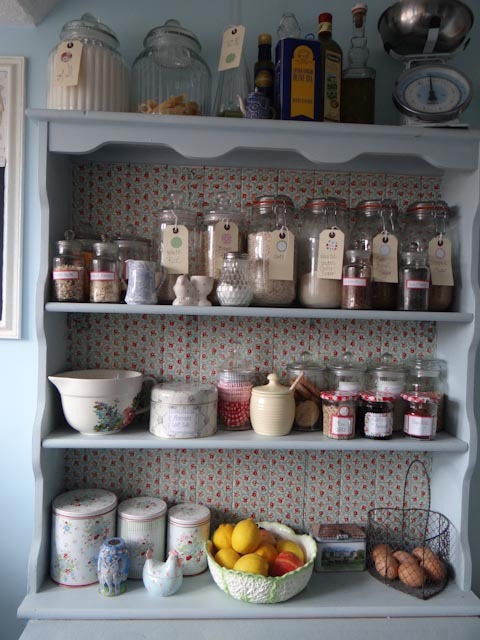 My little kitchen is very short of space – and I could not use shelves because the walls are plasterboard. This has given a solution for all the necessities close at hand. It looks pretty too.